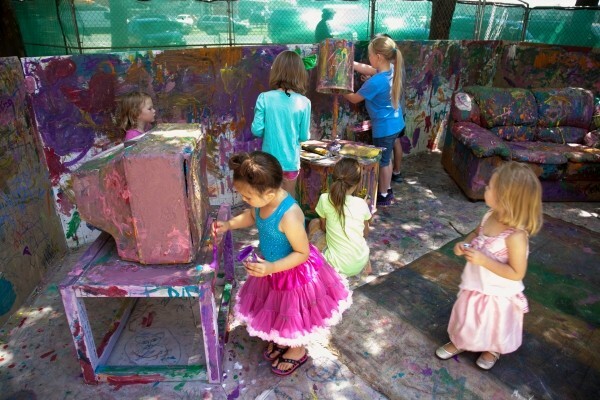 Kids at play in the Art Yard at the 2013 Utah Arts Festival. Events with the scope of the Utah Arts Festival can be thrilling—but they can also be intimidating. The weather, the size of the crowds and the multiple activities can scare away those who might truly love the festival, if only they could figure out where and how to take their first bite. Those who come simply to dive in and see what happens can always take that route. But for those who feel more comfortable with a plan, here are sample recommendations to help people with a range of different needs, interests and concerns get the most out of their UAF experience. Parents with young children shouldn’t have to worry about when they’re going to melt down—or, given the possibility of hot summer temperatures, just plain melt. Take Trax. It’s a fun way to start for many kids, and drops you closer to the festival grounds than you’ll be able to find parking. Come early. Early-bird tickets on Thursday and Friday (entry between noon and 3 p.m.) are $6 instead of $10 for adults, with kids under 12 getting in free. In addition to the price benefit, you’ll get in ahead of the hottest late-afternoon hours. Enjoy the ArtYard. Hands-on activities provide the kids with something to take home for no added charge; other nearby activities, including the Mad Hatter and face painting, do require a small additional fee. Eat Early. If you’re going to eat on the premises, consider an early dinner. Waiting until 6 p.m. to get in a food-vendor line pretty much ensures a longer wait, and a harder time finding a table at which you can enjoy your meal. Hydration, sunscreen and shade. It’s good advice for every attendee, but even more so with the little ones in tow. Some come to the UAF just to watch; others are gonna want to do a little creating of their own. Follow That Line workshop (Main Library Special Collections Room), 1 p.m. Thursday: Artist Sue Martin (from Art at the Main) provides instruction on using line to “start and enrich your paintings.” $15 fee. Urban Arts (east of The Leonardo), all day: Attendees can paint a portion of the “100 Artists 1 Image” community mural project, or work with puppets, music and green screen to create a digital collaborative puppetry experiment. Pixels to Paint (Makers area at The Leonardo), all day: Create an image in a digital environment that will be transferred to paper or canvas through a motor-driven computer plotting system. Create Your Own Comic Book (Community Writing Center), 2 p.m. Friday: Work with local writers and artists on a quick project in graphic literature. Wasatch IronPen Literary Marathon (Community Writing Center), 6 p.m. Friday: Learn what you can create in just 24 hours in fiction, nonfiction or poetry categories—or if you’re particularly inspired, all three. ReCreate, RePurpose (Library fourth-floor conference room), 1 p.m. Sunday: Learn the art of finding new sculptural art in recycled materials with Beverly Mangham. $10 fee. Art from Plastic (Makers Workshops at The Leonardo), 4 p.m. Sunday: One of many hands-on workshops for crafty creators. If you’re working during the week and want to squeeze in a little bit of everything on Saturday and Sunday, here’s a way to make it work. 12 p.m. Saturday Artist Marketplace: Wander through the booths of 163 talented artists presenting painting, sculpture, photography, jewelry, crafts and much more. 2-3 p.m. Saturday, various locations: Musical performers at The Leo stage, Garden Stage, Park Stage & other venues provide options for any musical taste. 4 p.m. Saturday, Team Poetry Slam (Big Mouth Stage): Catch the rhythms of local poets. 5 p.m. Saturday, Student Chefs (near Garden Stage): Students from local culinary school programs will create original treats, and you get to sample them. 6:30 p.m. Saturday, DRUM (Festival Stage): An original ballet commission by Ballet West’s Christopher Ruud. 8 p.m. Saturday, Utah Short Film of the Year Competition (Library Auditorium): Cool off while watching winners of local competitions from throughout the year, plus entries from university and community film programs. 9 & 9:45 p.m. Saturday, Music/Performance Headliners (Park & Festival Stages): See folk artist John McCutcheon and Josiel Perez’s AC Jazz Project. 2 p.m. Sunday, IronPen Winners (Big Mouth Stage): Listen to the work that was created by participants in just 24 hours. 6 p.m. Sunday, Wiseguys Standup Comedy (Big Mouth Stage): Laugh with some of Utah’s funniest local comedians. 8 p.m. Sunday, Strange Fruit (The Round): The Australian street performers dazzle audiences with a kind of circus “dance” on swaying 15-foot-tall poles. 9 & 9:45 p.m. Sunday, Music/Performance Headliners (Park & Festival Stages): Wrap up your weekend with the funky didgeridoo-laced world sound of Harper & Midwest Kind, or the fiery theatrics of Samba Fogo.